For most families, mornings are the most chaotic time of the day. Getting yourself ready and out the door in conjunction with your children is no small feat, and one that often involves lots of rushing around, nagging, stressful conversations and everyone feeling frazzled. We have brainstormed and scoured the net to bring you the best organization tips and genius hacks that will make for breezy mornings where everyone is ready to go on time, and most importantly, leaves the house with a smile on their face. A stress-free morning starts the night before (or in some cases, days before) with a little extra leg work. Put in 10 minutes at night and you’ll save double that in the morning – a worthy pay off indeed! Nothing can slow down a fast-moving train like a child hemming and hawing over what to wear. Nip that indecision in the bud by planning your child’s outfits for the week in advance. We suggest doing this on the weekend when you have a little extra time, and to include your child in the selection process. Collect all of the outfit components (clothing, under garments, socks, and accessories) and organize them by day using one of the smart methods below. (3) Use a nifty hanging closet organizer like this example from Better Homes & Gardens and put each day’s outfit onto a different shelf. Try this 6-shelf one from Innovative Home Creations ($8.99) which already includes the days of the week! 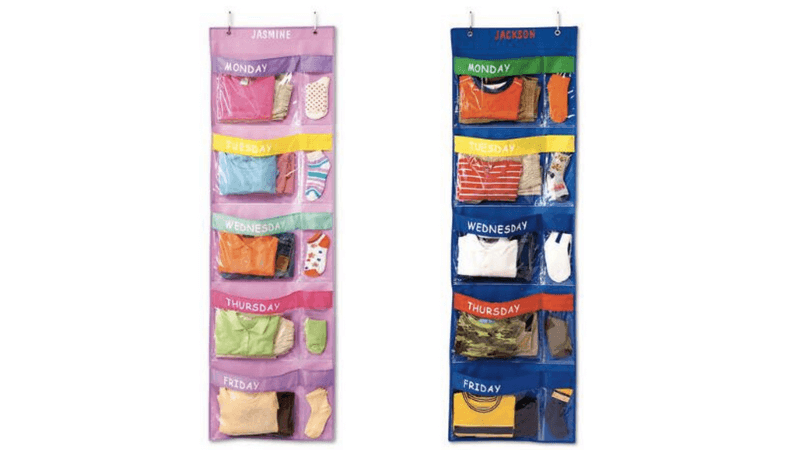 (5) We also love this incredible over-the-door Days of The Week Hanging Organizer that has a large pouch for the clothes and a smaller section for any socks and accessories. It can even be personalized! (6) “Today I’ll Wear” Hanger: Make a special area to hang the next day’s outfit, all ready to go. Use a simple damage-free Command hook on a wall or behind a closet door. Or make it a little fancier like the one pictured here from House For Five, using a frame and vintage drawer pull. (7) Alternatively, use these custom Days Of the Week hangers from R Michael Creations – the days are actually burned into the natural wood! (9) Grab some of these Weekly Hanger Markers ($11.75) for a simple solution that’s great for older kids who can hang their clothes independently, and may turn their nose up at any “kiddy” systems. 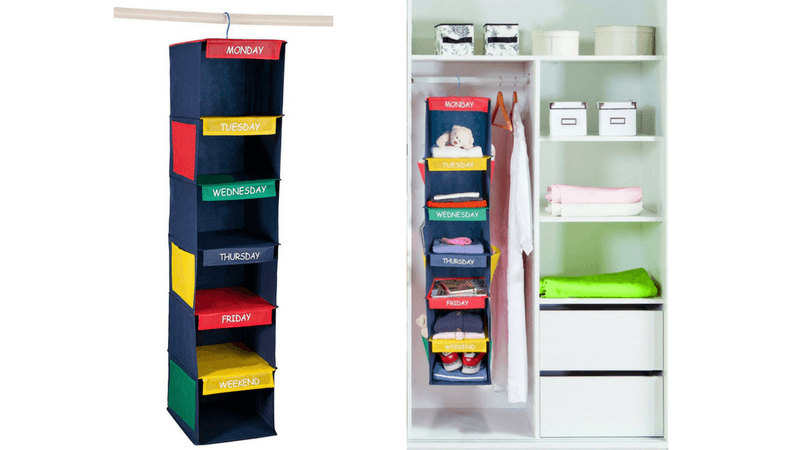 (10) We also love the Sugarbooger Children’s Closet Dividers ($9.99) which you can label with the days of the week (and also includes size or type labels for the ultimate organized closet!) or these Oblong Rack Dividers ($8.99) which have big bold writing that is easy for kids to read. If you have a daughter, you’ll know that outfit planning goes far beyond clothing, and keeping their accessories neat and organized is a key component to a smooth morning. If everything has a place, it’s simple for you and your child to select their matching pieces for each day and the multitude of bows, clips and elastics are much more likely to find their way back “home” at the end of the day. 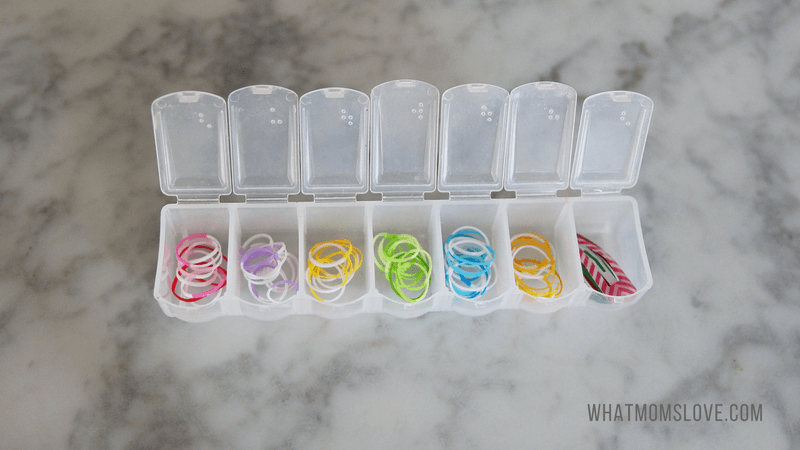 (1) For those teeny tiny hair elastics, try a weekly pill organizer like this one. These are also fantastic for travel — just pop it in your bag and you’re good to go. (2) If you’re handy, try this stunning rustic Hair Bow Clothes Line from Live A Little Wilder. It’s fantastic for displaying soft headbands and could even be used for jewelry too. (5) If you’re really overrun with bows, clips and headbands, opt for an inexpensive Tackle Box with multiple levels! (6) We love this clever idea from Tatertots & Jello that uses Silverware Trays to create a colorful and super organized storage area for a child’s jewelry collection. A pre-packed backpack is crucial in your smooth exit from the house because it’s often the step that holds you up when you are thisclose to leaving. Make sure you involve your kids in the process (have them fly solo if they’re old enough), and pack it up before they go to bed as part of their nighttime routine. This includes any homework or folders (checked by mom if necessary), signed forms, library books, etc.